We hope ICE watches this video. No crimes, no violations of supervision, a father, a husband, a loved member of his community, the sole breadwinner with valid work authorization, a job to go back to and a stay in place. Keeping him in custody simply because they can. Syed Jamal continues to be detained at taxpayer expense despite having valid work authorization, a job and being the sole bread winner. The family is attempting to visit him on Sunday. 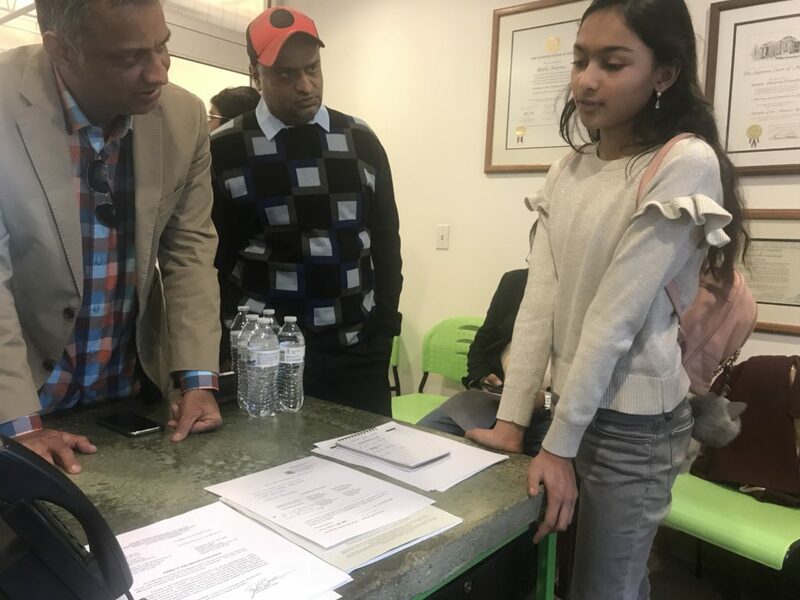 Meanwhile, Congresswoman Lynn Jenkins visited with Syed’s wife and three children about the private bill she introduced Tuesday, seeking to aid Syed in his legal fight to avoid deportation. 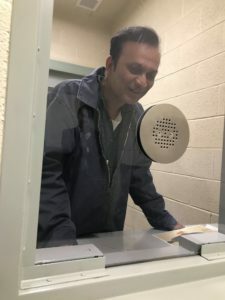 The bill would make Syed Jamal and his wife, Angela Zaynub Chowdhury, eligible to receive an immigrant visa or to adjust their status to permanent residency upon filing an application. Video of the press conference held earlier today outside the Platte County Jail, where Syed Jamal arrived at 2:30 and is being detained. 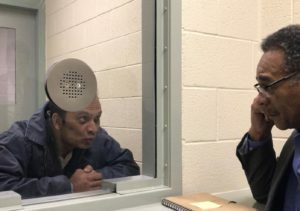 U.S. Rep. Lynn Jenkins has introduced a private bill seeking to aid Syed Jamal in his legal fight to avoid deportation. 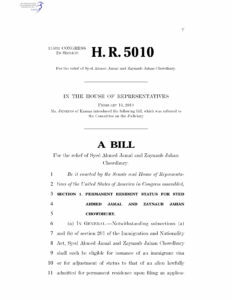 The bill, which the Republican congresswoman introduced Tuesday in the U.S. House of Representatives, would make Jamal and his wife, Angela Zaynub Chowdhury, eligible to receive an immigrant visa or to adjust their status to permanent residency upon filing an application. CONFIRMED: Syed Jamal will be back in Kansas City this afternoon. He is coming home. Brian Johnson with KMBC also put together a piece addressing the same question, focusing on the difference for those who enter the US as students or workers under non-immigrant visas versus those that come in under immigrant visas. Why Didn't Syed Jamal Apply for Citizenship? We sincerely appreciate these reporters and their stations for trying to not just report the news on the latest developments in these people’s stories, but also trying to help us educate the public on how truly complex, and unique each story can be. While our focus over the last week has been on Syed Jamal, it’s important for everyone to realize that there are many all over this country, facing our dysfunctional immigration system. This is the story of Carlos Alberto Bringas-Rodriguez, another one of our clients, also having gone through great struggles and confusion while trying to remain in our country legally. At 4:56pm today, a Motion to Change Venue was filed in the federal habeas case asking the Court to either send the federal habeas case to Hawaii or Order DHS to return Syed to Missouri so the court here can continue to hear the case. This was done because when a person is no longer in the jurisdiction, the federal court is at risk of losing jurisdiction over the case. Attorneys for the government have indicated they are coordinating efforts to bring Syed back to Kansas City, however the exact timing of that remains unclear. It is the hope of many that his return to Kansas City will be very soon. The other development is that Congresswoman Lynn Jenkins, today introduced legislation known as a “private bill” to grant Syed and his wife lawful permanent status. While that process is time consuming, it is indeed an extraordinary event. Lawmakers from both sides of the state line continue to coordinate efforts and have shown eminence in leadership to support and protect this family. Today has been quite the opposite kind of day from yesterday. Not much new development today. Syed is still in the Honolulu Federal Detention Center, and we are awaiting an update from his case worker on what the decision is with the new stay in place if he will be moved or not, and if so where. We’ll update you as soon as we have any news. This is the video from this afternoon’s press conference. We know the plane he is on will stop in Honolulu to refuel. Due to the fact that is still US soil, because of the stay granted by the Board of Immigration Appeals, Syed Jamal will be pulled off the plane there. We will provide updates on where his next destination is once we get that information, which may not be until tomorrow. The Board of Immigration Appeals has responded to our appeal and a motion for a stay of removal, it has been granted. A report we received on Syed’s whereabouts is that he is on his way to Hawaii. Outrageous! 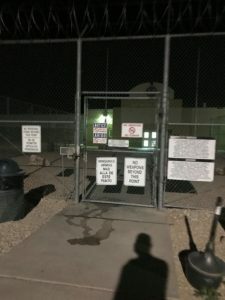 What we know is that Syed was taken from the West Texas Detention Facility at 5:51 AM (6:51am CST) by El Paso ICE ERO. At 11:45am CST we received the decision of the Immigration Court denying his motions and dissolving the stay. At 1:00 PM CST, we transmitted an appeal and a motion for stay of removal to the Board of Immigration Appeals. By 1:26pm CST the motion and the stay were docketed by the Board. As of this update, the ICE locator still lists Syed at the West Texas Detention Center even though we have reason to believe he is not there. We have not formally or informally been notified as to where exactly Syed is currently located. We don’t know when ICE received the decision of the Court. And we do not know how such swift action by ICE could have occurred if all parties had been notified at the same time. An attack on the system is an attack on due process. At approximately 11:45 am CST we received word that Judge Baker denied the Motions pending before him and dissolved the Stay of removal previously issued. At approximately 1:00 pm CST An appeal notice along with a fresh motion for stay was forwarded to the Board of Immigration Appeals in Falls Church Virginia. We have been diligently using every resource we have to confirm Mr. Jamal’s whereabouts. We have learned, not as a result of ICE informing us, that he was taken to a plane at 5:50am this morning. We will provide updates if and as we get more information. There is a local KC event this afternoon in support of Mr. Jamal and others. It is being hosted by the KC Metro Immigration Alliance – KC MÍA. It is confirmed that Congressman Cleaver is confirmed to speak at the event. We visited Syed Ahmed Jamal at the West Texas Detention Facility this evening. We were accompanied by Congressman Emmanuel Cleaver II. We went to ensure our client understood what was happening in his case and make sure he was being treated well. 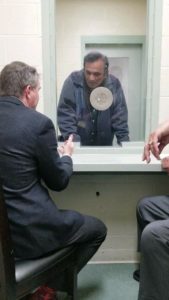 Congressman Cleaver went to meet the college professor, who had never committed a crime, but who was taken into custody by ICE from his front lawn and in front of his child. The Congressman went to meet the man who was so beloved by his community and his family that they were fiercely rallying for his release. He also went to give support to a man in detention nearly 950 miles from the only place he considers home. As they spoke Syed asked the Congressman how the Congressman’s wife was doing. And in that moment we all learned why so many people are vociferously supporting Syed. 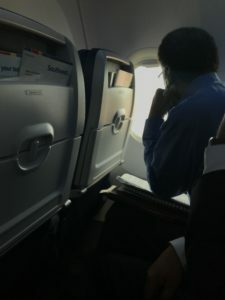 Because even in the face of such distress, Syed took a moment to focus not on his own predicament, but instead to ask this Congressman, who had traveled so far to provide comfort, how his wife was doing. Humility and grace in the face of adversity. Congressman and Methodist minister, Emanuel Cleaver, and Michael Sharma-Crawford are en route to El Paso, Texas to visit Mr. Jamal. Watch our Facebook Page for posts once they arrive. At Noon today, DHS filed their Opposition to Syed Ahmed Jamal’s Motion to Rescind and Reopen his deportation case. The Opposition was based upon their belief that the deportation order was valid and that Mr. Jamal’s safety would not be at risk if he is returned to Bangladesh. Once the DHS opposition is filed, it was imperative that we file our Response immediately, to ensure the Court would have all relevant information and arguments in order to make a decision on the filings. At 3:45pm today, the Response was filed. At this point, the record is now considered closed and will be reviewed by Judge Baker, the immigration judge who granted the temporary stay on February 7th, and he will provide a ruling on the pending motions. The ruling will determine whether Mr. Jamal’s case can be re-opened in court and whether he should be deported or not. It is unknown how long the Court will take to review the matter, however, it is likely that a decision will come in the coming days. The government also filed a motion to dismiss our filling on the federal habeas petition. That dismissal seems to indicate that since Judge Baker had granted a temporary stay, the federal court should allow the process to proceed only in front of him. While there are greater issues than simply the stay that are before the federal court, the Dismissal motion is being reviewed and a response will be timely filed in that matter. At this time, a Response has not been ordered by the Court but normal schedules allow for a Response to be filed on or before February 23, 2018. We received word that DHS has filed the opposition to our filing. We’ll provide more information shortly. Video of the call Syed Ahmed Jamal’s family received from Representative Cleaver this afternoon. Syed Ahmed Jamal was was transported to the West Texas Detention Facility in Sierra Blanca, TX, where he will remain until Monday, February 12. 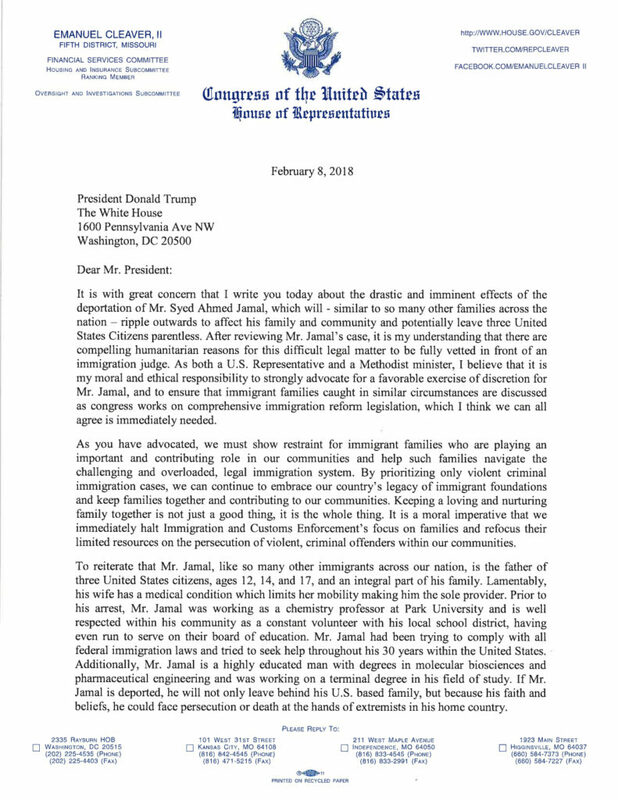 We have received a letter from Representative Emanuel Cleaver, II to President Trump regarding Mr. Jamal’s case. Mr. Jamal’s family also received a call from Representative Cleaver this afternoon to assure them he is doing everything he can to help reunite them. An immigration judge has granted a stay for Mr. Jamal. He is now in the custody of ICE officers. At this time, he will not be deported, but the stay is temporary. We learned that Syed Ahmed Jamal was moved closer to the airport. We filed in federal district court on a habeas petition. We are asking the court to release him since he was taken into custody illegally. The lawsuit is filed in the Western District of Missouri. 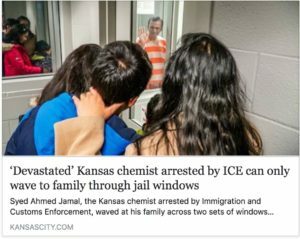 Kansas City, MO (February 7, 2018) Immigration and Customs Enforcement (ICE) officials took into custody Syed Ahmed Jamal, a husband, father of three, chemistry professor and community leader, on January 24, 2018. Mr. Jamal is detained at a Morgan County, Mo. jail while awaiting an immigration judge’s decision on granting a stay of removal. The motions for a stay of removal and to rescind a final deportation order were filed with the court and served on Department of Homeland Security (DHS) attorneys on February 5, 2018. They remain pending. Mr. Jamal has deep ties to the United States having come to America from Bangladesh over 30 years ago on a student visa. He was granted an H-1B visa for highly skilled workers and then transitioned to another student visa when he enrolled in a doctoral program. Despite his efforts to secure permanent status in the US, he found himself in removal proceedings. He was advised by an attorney that he was only eligible to leave the country voluntarily, despite his fear of returning to Bangladesh. His failure to depart caused the triggering of an automatic deportation order. Mr. Jamal obtained his work permit after DHS placed him on an Order of Supervision (OSUP). OSUPs are given to individuals so that they may remain out of custody despite the existence of a deportation order. They allow individuals to obtain employment authorization from DHS. At the time of Mr. Jamal’s arrest in January, he was an adjunct chemistry professor at Park University in Kansas City and was conducting research at area hospitals. Without a stay of removal, Mr. Jamal remains at risk of being deported from the U.S. as soon as early next week and before the Immigration Court can review the matter. In accordance with the February 20, 2017, Kelly Memorandum, Enforcement of the Immigration Laws to Serve the National Interest, it is unlikely that ICE officials will exercise prosecutorial discretion in releasing Mr. Jamal from jail or allowing him to remain in the country. Contrary to what ICE had indicated, Mr. Jamal was not charged with or convicted of any crimes, misdemeanor or otherwise. Sharma-Crawford says, “This is another American story turned into a nightmare by the current divisive climate regarding immigration. It sends a false message that immigrants are criminals and detrimental to America.” ICE statements also have indicated that Mr. Jamal appealed his case. The Board of Immigration Appeals (Board) reviewed his case based on their “certification” authority, and as such, to call it an appeal is a mischaracterization of what occurred. Several members of Congress show a willingness to maintain a sense of humanity in the immigration debate. Rep. Emanuel Cleaver (MO), Rep. Kevin Yoder (KS), and Rep. Ro Khanna (CA) voice their concerns about the methods ICE used in this instance. “Children should never have to watch immigration officials forcibly take a parent from their home. The damage the Agency is doing to the next generation is profound,” Sharma-Crawford states. This entry was posted in Blogroll, Immigration Law - News, Recent Rulings and Victories on February 7, 2018 by Sharma-Crawford.